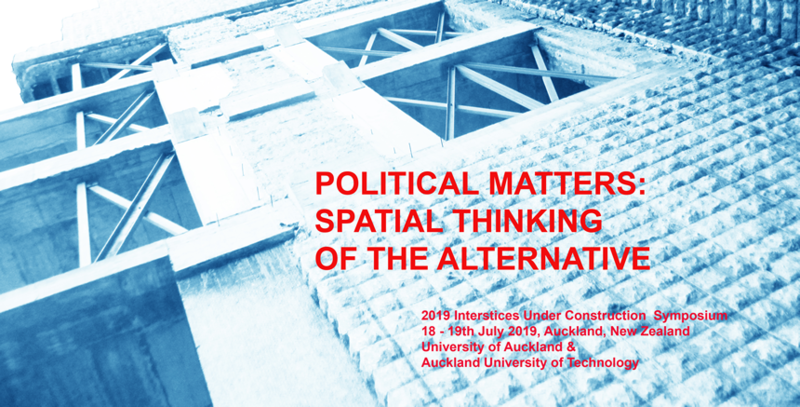 By considering architecture beyond academic and aesthetic analysis, and more than a mere branch of traditional art history or a civilization's will to form, this symposium addresses the relation between architecture and the political. We invite papers that reflect on and analyze the disciplinary and oppressive regimes accommodated by architectures at different levels—individual, social, cultural, environmental, economic or legal. More so, in this symposium we seek to formulate the hopeful, active and productive role architecture may have in the formation of social movements and in transformations of everyday contemporary life. This symposium, then, invites papers that address the possibilities for alternatives—specifically architecture with new rationales and organization beyond scenographic or ready-made solutions proffered in the excluding interests of market economies. Preference will be given to papers that engage with theory as a way to expand the traditional narrations of the built environment. Architecture as an instrument of power and control, including the political role of architecture. The political possibilities for architecture beyond the expression of hegemonic order. Rethinking the contemporary urgency of theorizing the nexus between politics and space as found in, say, the works of Michel Foucault, Giorgio Agamben, Gilles Deleuze, Felix Guattari, Hannah Arendt, Chantal Mouffe, Michael Hardt, Antonio Negri, Judith Butler and Paul Virilio. The role architecture assumes amidst increasing border control, permanent security, aestheticized threat, human rights violations, displacement and spatial violence, and how it can assist in transgressing the present modes of governing. Ways of engaging with questions of conflict, security and territorial stability but not at the expense of dehumanizing the Other, or ways of addressing rights to territory and ownership without denying the rights of people to access or dwell in that space. Architectural alterity arising at peripheries or in transitional contexts and with disavowed or occluded histories relative to identity reconstruction. The spatial techniques through which power relations permeate into human flesh, desire and action. A short biography (approximately 100 words) for each author including name, affiliation, contact details (postal address, phone number and e-mail) and abstract title. > 01.08.2019 - Call for papers for Issue 21 of Interstices: A Journal of Architecture and Related Arts. Professor Felicity Scott, GSAPP Columbia University, U.S. Professor Ian Buchanan, University of Wollongong, Australia. Bernard Khoury/DW5, Architect, Lebanon (TBC).